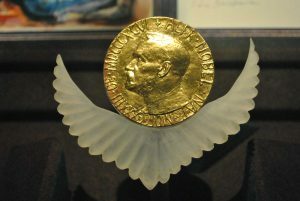 Any Nobel Peace Prize winner is bound to elicit varied responses, including praise from those on the side of peace and rebukes from those on the side of conflicts and violence. However, the Nobel committee’s choice this year raised more questions than it did in the previous years. Among the record-breaking 376 individuals and organizations nominated this year, the award went to Juan Manuel Santos, the Colombian president who helped broker a peace deal that ended a 52-year-old civil war with the Revolutionary Armed Forces of Colombia, albeit the success of the deal being a short-lived one (Colombians rejected the deal in a referendum that followed). The Nobel Peace Prize is more than flashy medals and prize money. PHOTO VIA WIKIMEDIA COMMONS. Before the announcement, the White Helmets, one of the shortlisted nominees, gained popular support from prominent individuals as well as news outlets for the utterly courageous work that they do. They are a group of civilians who volunteered to be the first responders in Syria where innocent civilians are being mercilessly targeted by the very government that is supposed to protect them. Their slogan is “to save one life is to save all of humanity,” but besides the noble virtue embodied in their motto, here are four other reasons why the White Helmets should have won the Nobel Peace Prize. 1. The sheer number of lives they have saved. Given the little equipment and expertise that this civilian group has, it has saved more than 60,000 lives in Syria, according to The Atlantic. While doing so, they have also lost 146 of their own during rescue missions and bombings. 2. The condition and resources available to them. Let’s keep in mind that these rescuers were ordinary citizens before the war broke out. They were carpenters, bakers, students and engineers, among many others. The remarkable work they do does not entail the comfort of negotiating with opposing parties in an office nor does it include even a tiny fraction of security that normally exists in those situations. The time cannot be more appropriate to convey a political statement about the shameful situation that the international community has allowed itself to reach in this crisis. Our failure to reach a consensus that could save our brothers and sisters will forever leave a grotesque mark in our history. The group said if they won the award, they would use the prize money to treat wounded volunteers and replace damaged equipment and facilities. On top of that, the Nobel Peace Prize would have served as a recognition of the horror faced by the victims of state-sponsored terrorism. 4. Not all sacrifices are equal. It’s not an overstatement to say that this job is somewhat suicidal. To rush over to a site of bombardment even though you could injure yourself or get killed is a selfless act almost unheard of in this current political climate. The White Helmets rescue victims indiscriminately. They risk their lives pulling innocent women and children from the rubble while retrieving bodies of government soldiers to give them proper burials. Although war has decimated much of Syria’s land, the White Helmets shows what unfettered resilience and true sacrifice look like. As common as this platitude has become, it really is true that not all superheroes wear capes — some wear white helmets.